What makes Southwest Michigan so special for the creation of award-winning wine? Nationally renowned for its beautiful lake towns, beaches, lighthouses, and dunes, Southwest Michigan shines in all of those categories of attraction. But I want to let you in on one of the hidden treasures of this region: the excellent wine-growing agriculture (viticulture) which produces an incredibly excellent variety of wines. 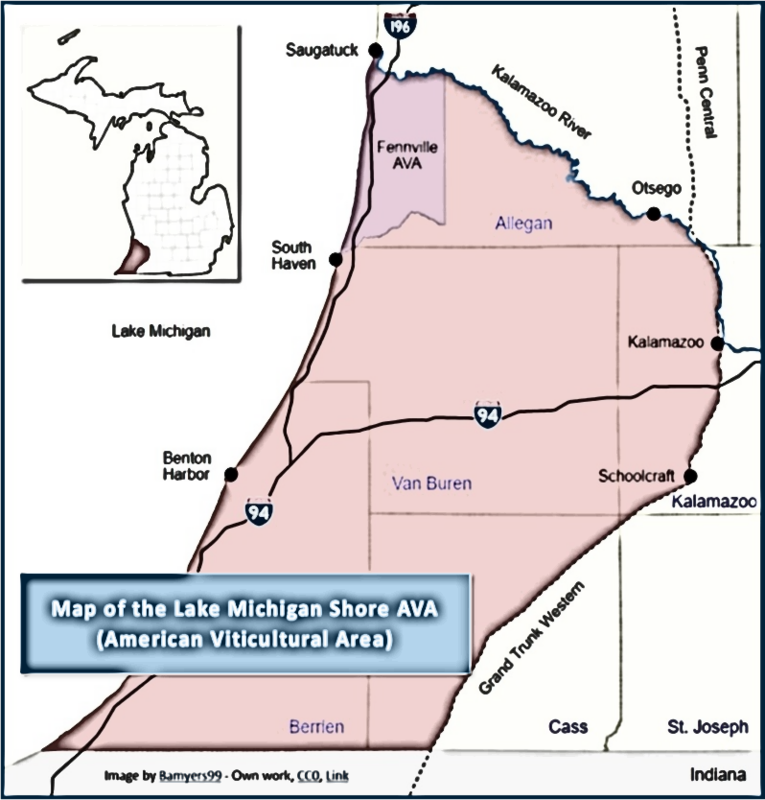 Close to the Lake Michigan shore in Southwest Michigan is terrain (in France, “terroir”) and prevailing westerly winds which provide ideal conditions for delicious wine grapes to be grown in the “cool climate viticulture” (named the Lake Michigan Shore American Viticulture Area⸺AVA⸺or “Lake Effect”). 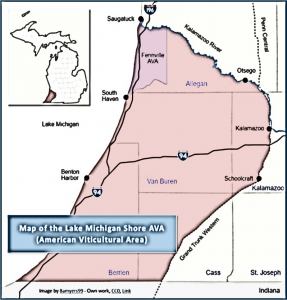 The geographical boundaries of the AVA reach from the Indiana border north to Fennville, and 45 miles east from the Lake Michigan shore; the home turf of half of Michigan’s wine production, as well as the majority of the state’s vineyards. The region’s vineyards were first planted in 1867. Going back even further to the Wisconsin Glacial Period (12,000-13,000 years ago) the shoreline’s sloping moraines were formed, resulting in today’s blessing of 42 different kinds of soils in the AVA. The sloping moraines also increase air drainage to the lake for the vineyards, thereby providing more protection from frost settling on the vines. 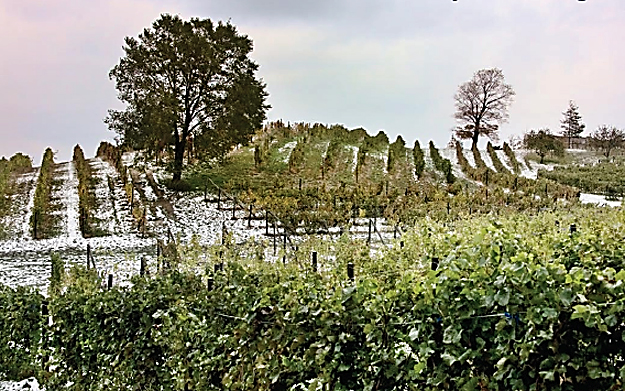 The vineyards of Southwest Michigan enjoy elevations of 650-900 feet. Like the major wine-producing areas of France, Germany, Champagne, Alsace, northern Italy, Australia, New York, New Zealand, and Oregon, the Southwest Michigan region is within a few degrees of the 45th parallel. Added to the nurturing terrain and soil is the enhancing climate of cool nights and warm days, which allows the grapes to mature with just the right balance of sugar and acidity, providing the crispness to white wines; and the complexity and depth to red wines. 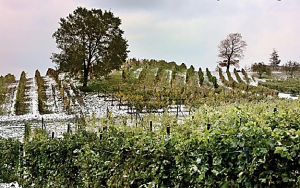 Temperatures moderated by the “lake effect” enhance the quality of the European grape varieties that are grown along the Lake Michigan shores. Now you know a little about why Southwest Michigan is becoming nationally recognized as a world-class wine-growing region. Every wine lover’s palate will be satisfied with more than 50 different grape varieties grown in Michigan, so come enjoy the delicious treasures waiting for your discovery at Southwest Michigan wineries. For a description of all Michigan-grown grape varieties used for the fine, award-winning wines that will, please visit: https://www.michiganwines.com/wine-grape-varieties. Come with us as we taste Southwest Michigan wines! Barry and I would like for you to join us in our exciting discovery of excellent wines grown right in our own back yard of Southwest Michigan! Come explore with us these Southwest Michigan country roads, rolling hillsides, abundant lakes and beaches, and small-city streets. There you will find the incredible treasures of 28 unique and excellent wineries from this picturesque grape-growing region. Taste the wide variety of vintages harvested from the vineyards and orchards which produce fine wines consistently producing regional, national, and international awards. Meaning, these Southwest Michigan wines are really delicious!! If you haven’t already tried wine-tasting in Southwest Michigan, we will tell you, show you, and share with you the great fun and adventure of visiting tasting rooms. You can actually meet the winemakers, be served by the friendly staff, and chat with fellow wine-tasters in each of the beautiful and unique wineries of the region. Explore award-winning hard ciders or craft beer. Even if you’re with someone who wants more variety or isn’t the biggest fan of wine, these wineries can satisfy such preferences. You can see how fun it is to experience even more treasures of this region: great restaurants, fruit orchards, craft breweries, the beautiful Lake Michigan shoreline, shops, local art, live music, distilleries, events, and fun things to do. You will absolutely love the variety—and the experience—of tasting Southwest Michigan wines! Excitement about the precious harvest of these vineyards is contagious, so once we got “bit by the wine-tasting bug,” we decided to produce a coupon card, Taste Michiana, to make it easy for you to go wine-tasting with your friends, groups, or you can just go solo (you can purchase Taste Michiana coupon cards at this website: https://tastemichiana.com/product/taste-michiana-wine-tasting-coupons/). We just enjoy the fun of tasting and comparing all different kinds of wines in this area, and hope that you will, too. And we plan on learning about them and enjoying the whole experience right along with you. So please come with us to Southwest Michigan…the wine is fine!